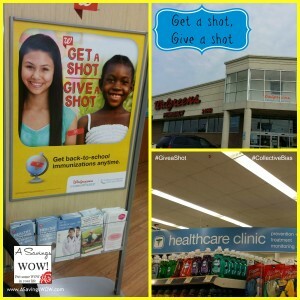 Walgreens Get a Shot, Give a Shot® Program | A Savings WOW! It’s that time of the year again – back to school! Along with that are many parents, including myself, who need to make sure that their kids’ immunizations and required vaccines are up-to-date. My son needs a shot to be up-to-date, so I made an appointment at the Walgreens Healthcare Clinic to get his done. What I love is that Walgreens has a program going on right now that when your child gets their back-to-school immunization there, they’ll help provide a lifesaving vaccine to a child in a developing country through the UN Foundation’s Shot@Life campaign. Visiting the Shot@Life site, it was eye-opening to me to see that in other parts of the world, one child dies every 20 seconds from a disease that could be prevented with a vaccine. This program is such an easy way to give back to the world and have something done that is needed for your own family. 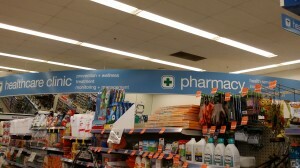 It was pretty easy to find out which Walgreens locations in my area have a Healthcare Clinic in them. All I had to do was go on Walgreens.com, select the store locator, and select “Healthcare Clinic” under “Popular Services.” It came up with a good-sized list of locations, one of which is only a few minutes away from me. I was also given the option to make an appointment online, which I love. However, Walgreens makes it quick and easy because no appointment is needed. Walk-ins are welcome. They also accept most insurance. I had called the phone number listed on the website because I couldn’t find an appointment time that worked well for us. The person that answered my call was able to schedule an appointment and check to see if our insurance is accepted. It’s good to know that ahead of time so you can prepare for your out-of-pocket cost. Luckily, our insurance is accepted and the immunizations are fully covered under our plan. I also found out that the Walgreens pharmacists will report back to our primary care physician so our records can be fully updated. When we arrived at our Walgreens location, it was pretty easy to find where the Healthcare Clinic was located in the store. There were huge banners hanging from the ceiling that led us to it. Our clinic was located in the back corner near the pharmacy. 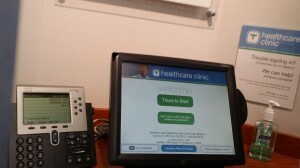 Once we got to Healthcare Clinic, the sign in process was very easy. Since we had scheduled an appointment, all I had to do was look up the appointment and sign in. 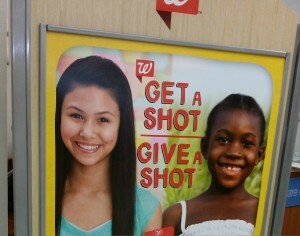 Also, while I was waiting, I saw the sign which showed the “Get a Shot, Give a Shot” campaign. It also had more information about ways to stay healthy. Unfortunately, on this day, I had a bit of a mom fail. I forgot to bring the rest of my son’s immunization records so they could give him the other shot he needed. I didn’t realize I needed it with me. However, I will be sure to bring him back once I have that in hand since I know how easy the process was to do and how it will also be an opportunity for Walgreens to donate an immunization to someone who may otherwise never receive one. Visit your local Walgreens Healthcare Clinic to find out more about this program and everything else they have to offer your family to stay healthy throughout the year.